I bought the ingredients for this soup almost a year ago, but it wasn't until this week that I finally got around to making it. The thing is that the two weirder ingredients the soup called for—kombu and bonito flakes—aren't the kind that would necessarily spoil, so I knew I had time. I knew they could just hang out in their sealed packages waiting for me. Those are the kinds of ingredients I like. No pressure. No beating yourself up when you find them months later in the back of your refrigerator, soggy and runed (rhymes with tuned). But before we go any further, I need to address the elephant in the room: Yes, Mavis got spayed. Poor thing. This past week, her life has been reduced to three main activities: going to the bathroom, staring off blankly into the distance, and sleeping. Matt and I struggled to understand all the staring off. It's a convincing gaze. So much so that I would find myself getting down to her level, adjusting my gaze-angle, to try and see what was there—to understand what exactly had caught her complete attention. Guess what? Nothing had! Hence, the term blank stare, I guess. No, but seriously, there's a for-real elephant in the blogosphere today. If you're a regular reader, you may have heard the good news already: Time magazine named Bon Appétempt as one of their top 25 blogs in 2012! And to continue my conjecturing, I guess what's happening is that you're catching me in my own blank stare. I guess, like a five-month-old puppy who was gnawing on her chicken-flavored Nylabone one second and coming out of anesthesia the next, I'm a bit shocked. And while I'm sure there's an essay, video, or book chapter somewhere in this haze, for now, I haven't quite figured out what I want to say, except for: Thanks for the recognition, Time! Those who express themselves and create in spaces like this for most-likely just the joy/need of expression make my heart beep, and though I'd like to think that I don't care what anyone else thinks, being recognized for what Matt and I've created is an amazing bonus that helps fuel our creative engines. And while we're on the topic of recognizing people, I want to take a quick moment to recognize Matt, the other member of Bon Appétempt who doesn't get as much credit but who without, this space would be video-less, full of crappy photos, and far-less edited ruminations on food, gymnastics, dance, and the human condition. Back to soup? Say you just made a ton of bolognese that lasted you for three dinners in a row and you were hoping to eat a little more healthily this week. Well, then, make this soup! You should be able to find the kombu and bonito flakes at your local health foods store. Maybe even Whole Foods? And once you have them, you can just put them away in your cupboard and wait until your body and soul crave hearty, delicious homemade miso soup. 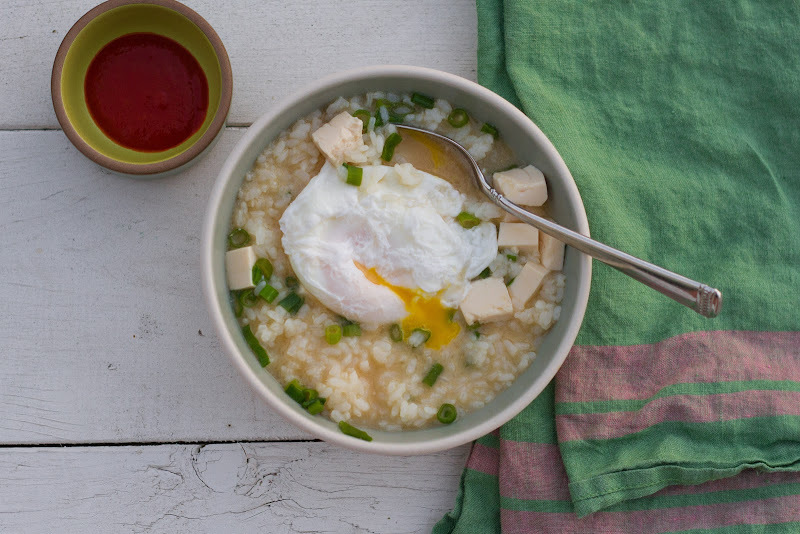 Word to the wise: don't skip the drizzle of sesame oil. And as for the chili garlic sauce it calls for? We used Sriracha. Brilliant meal. Now, if you'd excuse me while I go stare off blankly some more. 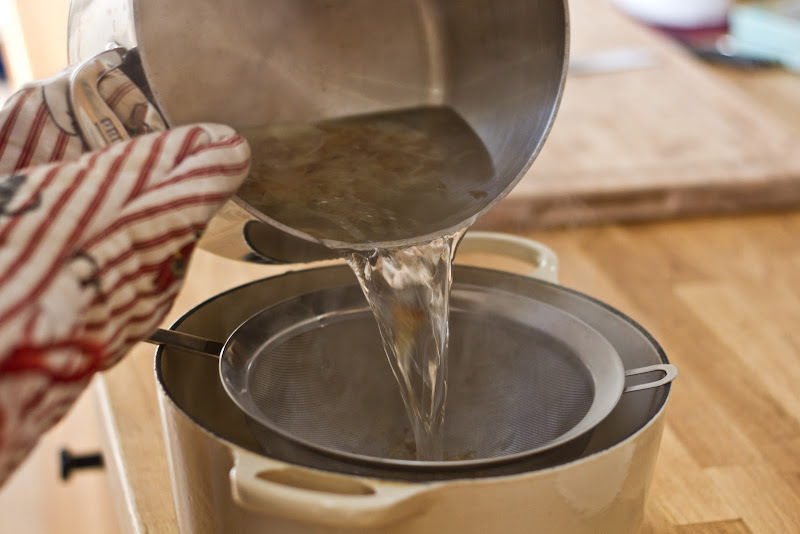 Pour 2 quarts of water in a large saucepan. Have a separate 2-quart bowl ready to the side with a fine mesh strainer or piece of cheesecloth. Place the kombu in the cold water. Turn the heat to high, and heat just to boiling. Turn off the heat and remove the kombu. Stir in the bonito flakes and steep for 5 minutes. Strain into the prepared bowl. Pour the strained liquid back into the pot. Bring the strained dashi to boiling. 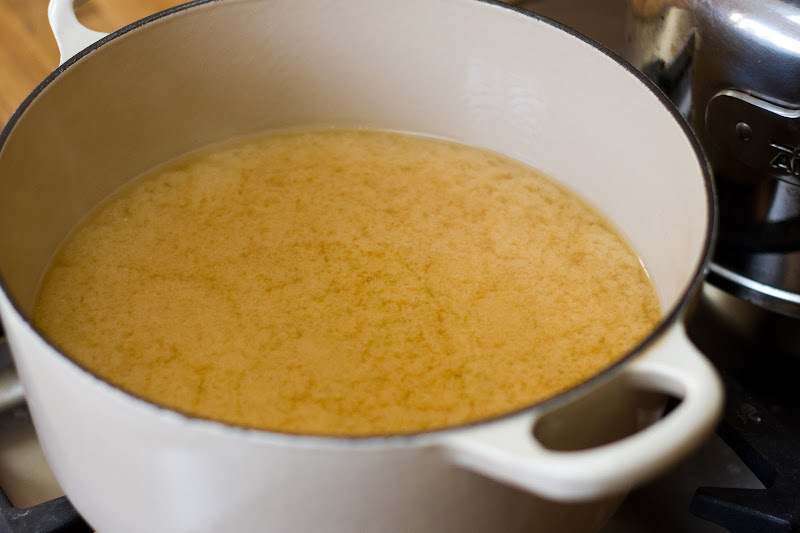 Ready the miso paste in a measuring cup or small bowl. After the broth has boiled, pour 1 cup hot broth into with the prepared bowl with the miso. Whisk until smooth and completely combined. Pour the miso and broth back into the pot and turn the heat to low. 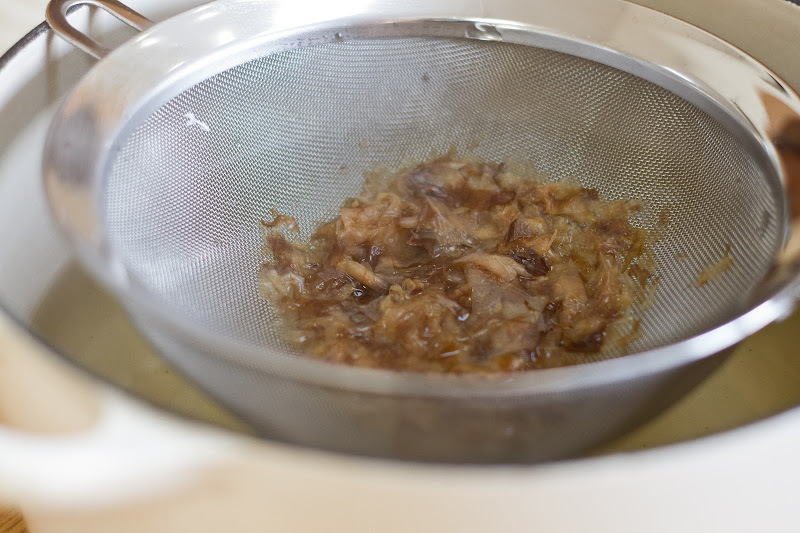 Whisk the miso until it is incorporated into the broth completely. Keep over low heat; do not let the broth boil after the miso has been added. Place 1 cup cooked white rice in each soup bowl. Poach an egg for each bowl of soup. You can see how to poach an egg here. 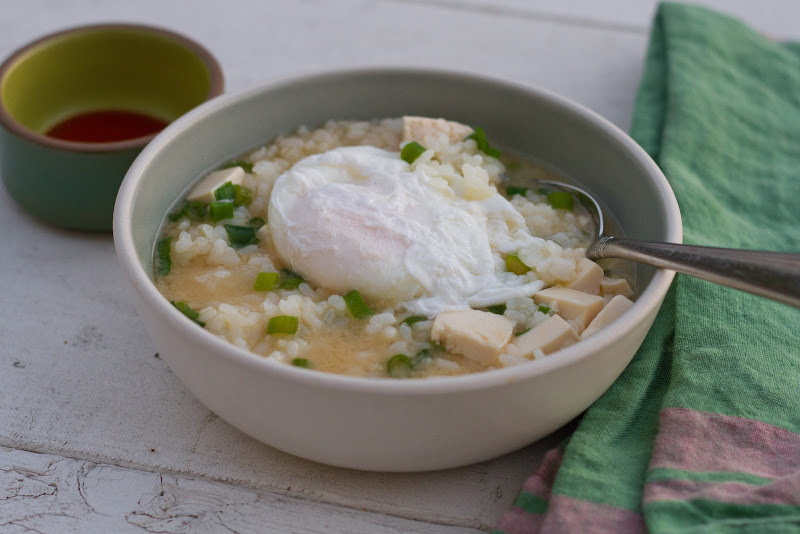 Pour about 1 cup of miso soup over the rice in each bowl, and place a poached egg on top. Serve with soy sauce, chili garlic sauce, and sesame oil. DUUUDE! That's HUGE! Amazing! I'm so so so so so so SO happy for you guys!!!!!!! holy scnhikes! awesome! congrats! funny because just this morning i was talking about how impressed i am by bloggers who really make it and how hard it seems, but also fun and how jealous i am. and i mentioned you and how fun it's been to watch you gain all this momentum and following. not that i've followed exactly from day 1.... anyway, way to go! this is so deserved. can't wait to see what's next. Aww, poor Mavis. We just came home from a week away and our cocker spaniel, Roger, has been giving us the same blank stare. CONGRATULATIONS on the recognition! We all know you're the best. Poor, poor, little Mavis! Is she starting to perk up at all? i found your blog on Time's article and have really enjoyed your archives. Cant wait to see more! Those photos are the greatest!!! Yes, poor Mavis. This blog could only be improved by MORE photo shoots in Spandex. Go Team! Wow, this looks amazing. Definitely one to put on the list for cold days. Congratulations! You are who I want to be some day (need to borrow your assistant though). Mavis will be her young self soon and the soup looks wonderful! Poor Mavis. But congrats to you and Matt!!! A post packed with news! A HUGE congratulations on being recognized by Time! I remember being so happy when your blog won its first Saveur award, then its second, and now this! It's only spaceships and stars from here. Mavis: It gets better. Wait, that's not right. I'm not speaking from experience. Also, can I just say that your blog kept me company when I was drenched with rain and sulking in some Spanish mountain village overrun with tourists? Yes, I was that person. A second also: This will sound creepy, but I just remembered that I think I may have seen you walking along Abbot Kinney over a month ago...could it have been you? Last but not least, that soup is what I call comfort food. YUM. Congratulations Amelia and Matt! Please give Mavis a sweet nuzzle from me. oh life. Oh life!!! awww, thank you, Sarah!! You've watched me grow on up!! Mavis probably will feel much better if you take off the dreaded CONE! If she fusses at her stitches, put the cone back on. And try again, you will probably be surprised at how quickly she gets it, and stops staring into space once the cone is gone. Of course, only do this when you can pay close attention to what she is doing. 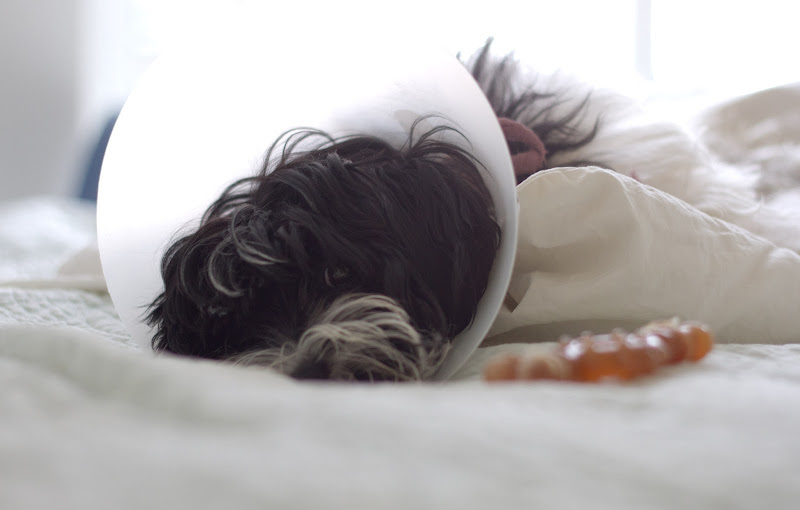 Wouldn't you just stare into space if you had a cone around your neck? Anyway, the summer peach cake was amazing with plums. Couldn't find peaches that were nice enough, but will try them next summer. Haha, there definitely was a middle-aged woman, though I don't recall a man. I was with Mike and it was only after passing and walking into a shop that I said, "That face looks familiar." Enjoy your weekend; I'm loving this sunshine! Time! SO great. Many congrats, friend. Hugs to you, (and Mavis). Oh and the soup? Divine. Congrats on the awesome award! You both deserve it - you keep us laughing and thinking and wanting to have fun in the kitchen. Thank! Mmm this looks like the ultimate comfort food! 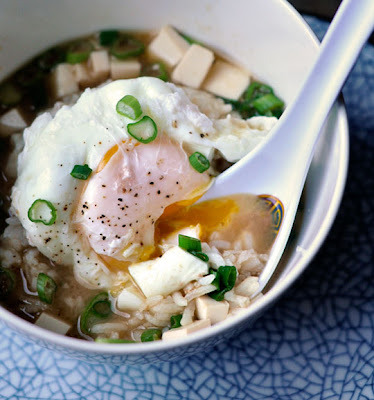 Soup with a warm runny egg! congratulations - that article's how i got guided to your blog. it's wonderful! this recipe sounds right up my alley, calming yet filling. perfect! Ah, miso! I recently made my own dashi for miso and was surprised at how moreish the whole thing was. I kept it simple adding the classic tofu, mushrooms etc, plus sesame oil and mirin, but your rice/eggy version looks great. What dish can't be elevated with the addition of a glorious egg? Always I thank for your recipe. maybe do you know doenjang soup?